Perhaps every once in a while we should all dip a calming toe into a simpler working life. That’s the idea behind zenware—offbeat software applications that deliberately eschew the busy, complex interfaces that most of us tend to use all the time. Jeffrey MacIntyre, in an article for Slate last week, created an interesting argument for what he dubs zenware. In it, he says you and the rest of us software users have “paved over every spare pixel in an iconistan of clutter.” If this rings a familiar note, perhaps a review of some of the better zenware applications, many of which are free and available for Windows or Mac OS X, is in order. Widgets, wizards, gadgets, icons, docks and system trays abound in today’s software landscape. Among applications that deliberately try to free you from all of the clutter, many are designed to keep you looking just at what you’re working on, minus interface distractions. In my opinion, word processing is a particularly optimized task for a zenware approach. There are several good word processors that reach for this goal, and my favorite one (for Windows) is DarkRoom. DarkRoom (see the document in the screenshot below) is a port of the popular zenware word processor for the Mac called WriteRoom. Both of these word processors present you with a stripped-down interface designed to keep you focused on the text you’re working on and little else. You can also see a lot of text on screen at one time. WriteRoom is good, but DarkRoom is free, and WriteRoom now costs $24.95. If you like DarkRoom, you may want to give JDarkRoom a try. It is a Java-based, cross-platform version of a zenware word processor. I use it on an Asus Eee PC, which runs Linux, because the Asus systems have small 7-inch screens and JDarkRoom looks much better on it than a cluttered word processor. Some applications are not designed from the ground up as zenware, but they give you interface choices that remove lots of the clutter you usually see. Scrivener, for example, bills itself as a “writing studio” and you can choose to write in a Full Screen mode in it that presents you with just the text you’re working on, in classic zenware fashion. It’s for Mac OS X and it costs $39.95. While on the topic of zenware as an interface choice, keep in mind that hitting F11 in either the Firefox browser or Internet Explorer will strip away menus and toolbars for a Full Screen view. That’s an on-the-fly zenware trick. Running scads of applications at any one time is an anti-zenware practice. If you do this a lot and you’re on a Mac, try Spirited Away, a free download that automatically hides an application if it hasn’t been used for a set amount of time. If you’re a Windows user, Swept Away is a similar product for Windows that automatically minimizes an application to the system try if you haven’t used it recently. Windows users may also like Dropcloth, which darkens out everything on your screen except what you’re currently working on (it’s free). Backdrop is a similar free utility for the Mac. Do you give a lot of presentations? If so, and you’re a Mac user, you can take a zenware approach to them with Desktopple Pro a $17 application that will automatically, temporarily strip all your desktop icons away for a clutter-free desktop view. Finally, in MacIntyre’s Slate article, he discusses AlphaXP Lite (Windows) and MenuShade (Mac), which change the transparency of windows and menu bars for a more zen-like presentation. As you can see, there are many ways to free yourself from desktop clutter. For more on zenware writing tools, see Leo’s previous post. Do you use any of these applications or any other zenware applications? Do you find zenware to be anti-evolutionary? I agree wholeheartedly about zen word processors. I do most of my writing, whether it’s meeting notes, Web copy, or anything else, in NoteTab, which is a tab-based Notepad replacement. Nor formatting, just words. It’s the best way I’ve found to stay focused. Plus it loads in seconds. @John Thanks for the feedback on JDarkRoom. There is now a forum for discussions & posting questions – please get in touch if you are still experiencing problems. 30 minutes tutorial to learn basics, lifetime to master. Works on EVERY operating system, so you don’t need a different editor for writing, coding, html or doing some changes on hosting server. I use SlickRun from http://bayden.com/SlickRun/. It’s tiny and hides in some corner of the screen with variable transparency and colors, and all you have to do when you want to open an application is to press a key combination you’ve specified (I use Alt+X) and start typing the name of a program you’ve added to its list. It remembers most used MagicWords and displays them first. It can show the date and time when not active. You can use it to take quick notes in a small window. Really very useful compliation of useful tips. You simply install it on the Mac and it lets you ‘mega zoom’ any window. 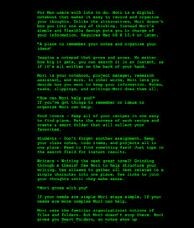 Terminal and/or your text editor of choice (TextMate!) are a good choice for an uncluttered writing environment. If you have lots of windows open in Win XP and want to close them all, simply press the Windows function key and the letter “M” to minimize all of your windows at once. Pressing F11 while using Internet Explorer has the same effect as in Firefox. There are a number of functions in popular software applications and OS’s that already do the same thing. In Win XP, right click on the Desktop, select “Arrange Icons By”, and then click on “Show Desktop Icons”, which will remove the checkmark from it, and all of your Desktop icons will be hidden, given you a completely clean Desktop. If you want them back, simply click on “Show Desktop Icons” again. There’s lots more, but no time now to go through them all. There is also http://willmore.eu/isolator/ for Mac which lets you focus on any single application. I agree with Robert – Q10 is the best WriteRoom clone for Windows. For “zen word processing” in Windows, I much prefer Q10 (http://www.baara.com/q10/)mainly because it has something that’s horribly overlooked in Windows word processors: live word count. On Ubuntu, if you can get past the Java bugs segfaulting the app entirely, JDarkroom creates a completely blank screen which does nothing whatsoever. I looked for a forum or a support link or, ya know… anything. There isn’t one. “Comment on my blog,” he says, and then closes comments on all the relevant posts. He’s not exactly slow to ask for a donation though. I want to echo your thoughts about Scrivener. I used it to write my last book and it contributed incredibly to my productivity. I’m using it now as I work on my second book. By the way, I get no benefit from making these comments (no affiliate marketing). Just the satisfaction of helpful evangelism!